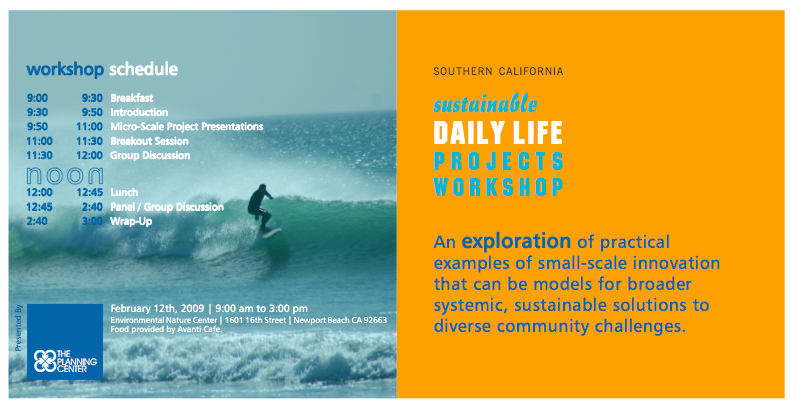 “What would life in a sustainable world be like?” Together with The Planning Center, we organized this workshop in Southern California for participants from grassroots organizations. Each presented case studies in which they use resources in a creative, original way. Jules Dervaes is a pioneer in urban edible gardens; he calls them “urban homesteads”. Jules has launched a social networking site to help disseminate what they have learned, and to multiply the groups involved. His practical concern was that planners might make it illegal to keep chickens in urban areas. California is spending more than $20bn on “green” school buildings. The state spends $65,000 per classroom seat for the building – versus $1 per child per year for garden upkeep and support. Mud Baron whose job is to help L.A. schools develop gardens and nature projects, wanted our help to persuade planners and architects that “contact with nature” – not just buildings – is a crucual ingredient of “green” schools. We proposed re-labeling school gardens as “outside classrooms” and thereby solve Mud’s resource problem at a stroke. Another one of our case studies, Proyecto Jardin, is an inspiring example of a bario-based economy. Irene Pena told us that this community garden for food and medicinal herbs must daily confront issues of land-use, group self-organisation, food coo-ps, seed storage, and green jobs – to name just a few.? Project Hope provides scholing to some of Orange County’s 16,000 homeless children. The project began in 1989 when a teacher began educating local homeless children from the back of her car. A huge issue is mobility: the foundation spends $8,000/month moving students around. We asked whether churches, hospitals and universities, with their often under-used spatial and human resources, could be added to the empty strip mall spaces, and half-abandoned motels, that are on offer now. ? 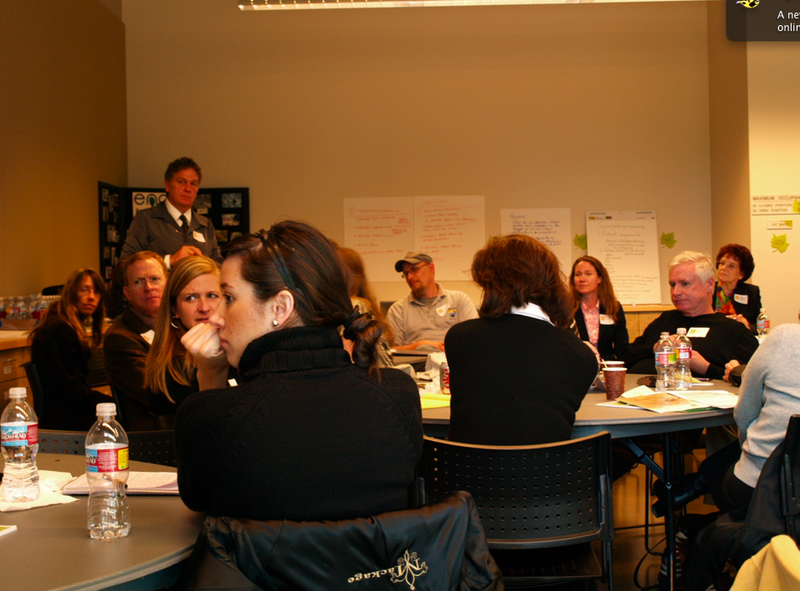 Brian Biery explained the concept of “place-based philanthropy” which was new to us. The Flintridge Foundation, of which Brian is programme director, closed its Conservation, Theatre and Visual Arts programmes in order to focus all its efforts on the community where Flintridge’s endowment was created, and where it is headquartered—Northwest Pasadena and Altadena. The two workshops in California were small-scale versions of the model we developed for Dott 07 in the UK, and for City Eco Lab in St Etienne in 2008.